Didn’t we do this less than 2 years ago? Jobless went from 7.5% to 9.8%. Do it again, Jobless to 11%. Insane!!! I know this is just a conservative shoutfest talking point these days, but on the off chance that anyone still cares about the actual evidence, a chart of unemployment is below. In February of 2009, when the stimulus bill was passed, the unemployment rate stood at 8.2%. It peaked eight months later at 10.1% and then started to decline. 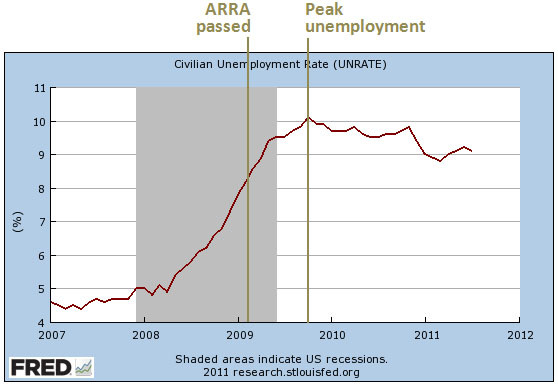 If you want to, you can argue that ARRA had no effect on unemployment over the long term, but there’s really no credible way to argue that ARRA was implemented so fast, and then had such an immediate effect, that it had any serious impact on unemployment up through the fall of 2009. CBO estimates that it lowered unemployment by 0.3% in the third quarter of 2009, and that’s about the biggest impact, positive or negative, you can credibly suggest at that point. “Approximately zero” is probably the best estimate so soon after the law was passed. The White House prediction that ARRA would lower the unemployment rate to 8% was one of the great messaging fiascos of all time. I hardly blame Republicans for throwing this back in the president’s face. Nonetheless, private forecasts suggest almost unanimously that ARRA did lower the unemployment rate, and in any case, it certainly had nothing to do with the unemployment rate rising in the immediate few months following its passage. Those are just the facts.